ALERT: Silent Killer Bug Now In U.S. – It’s Being Called ‘The New AIDS’. This deadly bug creeps in the night and bites you on your face while you’re fast asleep, and you never know what happened until you become dangerously ill from the disease it spreads. This disease is being dubbed the “New AIDS of the Americas” by researchers because it’s initial symptoms are hard to detect. Many call it the “kissing bug” due to its exclusive attack place being on one’s face. Doctors are calling it a silent killer – and are not completely prepared for it’s arrival. The reduviid bug has recently made its way north onto US soil. Endemic to Latin America, it has already affected 17 residents in Houston, Texas, the Washington Post reported. The tiny insect feeds on human blood much like a mosquito, but it is specific to biting the victim’s face. Reduviid bugs carry a parasite called Trypanosoma cruzi, which causes Chagas disease in its human hosts. At the onset of the disease, the infected will experience fever, fatigue, body aches, rash, diarrhea and vomiting, according to the CDC. Its initial acute stage turns into a prolonged asymptomatic state for some bitten by the bug, at which time a few parasites are found in the blood. However, the disease can cause heart failure and intestinal complications over time. “People don’t normally feel sick, so they don’t seek medical care, but it ultimately ends up causing heart disease in about 30% of those who are infected,” Nolan Garcia, an epidemiologist at the Baylor College of Medicine in Houston whose research focused on Chagas disease in the US said. 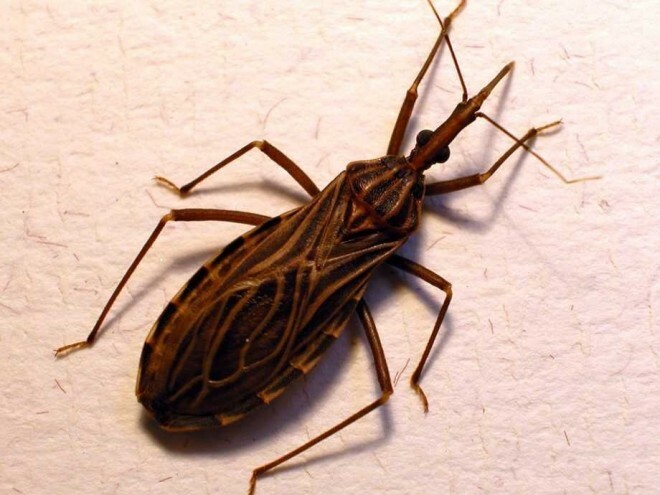 “We think of Chagas disease as a silent killer,” Garcia added. The American Society of Tropical Medicine and Hygiene (ASTMH) released a report last week outlining the ramification of this bug infestation and claimed US healthcare workers lack awareness which prevents successful diagnosis and treatment of this disease. The report noted that the dearth of federally licensed drugs to combat the disease also limit patients access to treatment. According to the CDC, Chagas disease is like the sister disease to Ebola, but much more stealthy.